After years of successfully avoiding ordained ministry, Dan Fahs finally acquiesced to God’s leading; he left a successful career in Minneapolis and moved to Chicago to attend Garrett-Evangelical Theological Seminary. He says, “I had sensed God’s direction for many years, finally, in 2002, I had the courage to follow where God was leading.” In greater Chicago-land, he and his wife, Jill, ministered to congregations in Wheaton, Winfield and, Wood Dale. 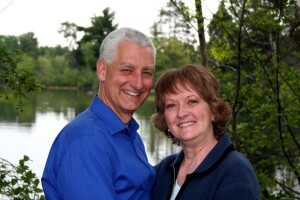 In 2007, Pastor Dan & Jill returned (home) to Wisconsin, first to Hayward, now to Oconomowoc. Pastor Dan is passionate about seeing lives transformed in response to a relationship with God through Jesus Christ. He feels strongly that a church fails to be The Church if it is not in mission — putting hands and feet to the gospel, by aiding the homeless, those imprisoned, and those in need. He has found life and joy in working with the small Mississippi town of Pearlington as the churches and the community recovered from Hurricane Katrina. He has also worked with the community and churches of Minot, ND as they recovered from the flood of 2011. He has provided leadership by taking United Methodism’s brand of Jesus’ ministry to southern Mississippi and Minot, ND where he and others have worked to rebuild from the damage and, more importantly, building relationships with the church and community. In addition to reaching out to those around us (loving our neighbor), Pastor Dan also believes we must grow more in love with God. He enjoys leading small study groups in which knowledge is not only learned, but also applied. He says, “I find that life is transformed in small groups.” He has designed and led a 6-month course titled Advanced-Advanced Lay Speaking. This class is founded upon his belief that the preaching life (and indeed all life-with-God) is fed by a growing relationship with God. He believes in lay leadership. He says, “It is the future of the church.” He enjoys teaching others so that they may then teach and lead others. Prior to working in the ordained ministry, Dan worked with senior adults as an Executive Director for assisted living communities in Minnesota and Wisconsin. He has a Masters in Health Service Administration from Cardinal Stritch University (1994) and a Masters of Divinity from Garrett-Evangelical Theological Seminary (2005). Dan and Jill have four children (and three grandchildren) living throughout Wisconsin. Dan enjoys long-distance bicycling, running, and playing the guitar. Jill enjoys reading, gardening, hiking and painting. Pastor Dan and Jill and thrilled to be at Good Shepherd United Methodist Church. They have a strong sense that God has led them to Oconomowoc.